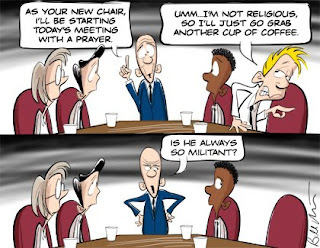 "Militant" Atheists, Why So Angry? Increased media coverage of atheism is valuable in that it reminds the public that we are out there, perhaps living in the same community as the Christians who despise us. And yet, the news media continues to perpetuate stereotypes about atheists by constantly characterizing us as "angry" or "militant." This is getting so tiring that I am considering composing a standard form letter which I can send to every newspaper who prints another "militant atheist" story explaining to them why this is an inaccurate description. I have previously explained why there is no such thing as a "fundamentalist atheist" or a "militant atheist," and I will not repeat myself here. Instead, I'd like to offer a potentially useful analogy to provoke some thought about why we should all care about these inaccurate phrases. I did not live through the 1960s, but I've seen the same documentaries and heard the same stories as you have about the Civil Rights movement in America. Remember the various Black militant groups? Some did carry weapons at times, but most were labeled by the media as "militant" for their rhetoric. At the time, newspapers and television focused on the guns carried by the Black Panthers and not the reasons some of these folks felt it necessary to arm themselves. They focused on how angry, extreme, and militant these groups were in their views without bothering to consider the source of the anger and whether it might be justified. This type of coverage may have been little more than sensationalism for profit. Conflict sells, and the papers were quick to capitalize. But the real impact of such coverage was to obscure the concerns driving much of the anger experienced by marginalized groups. By casting members of these groups as dangerous radicals, it was easier to dismiss them without ever inquiring about whether some of their complaints might have merit. I see something similar happening today. The stories on Harris, Dawkins, Hitchens, and our other atheist authors typically quote their most inflammatory statements. Headlines constantly refer to "angry," "extremist," or "militant" atheists. Why are atheists angry? That question rarely comes up, and when it does, it is often cast in the same sort of dangerous radical garb as was used for the Black activist groups. The typical article about atheism today includes a few inflammatory statements and wraps up with the reaction of some random Christian. We see conflict but are given little insight into the realities which underlie the frustration some atheists feel. Could it be that we atheists have many valid reasons for feeling angry? Perhaps, but you would never know it from this sort of journalism.